Bioelectromagnetics is the official journal of EBEA and of the Bioelectromagnetics Society. 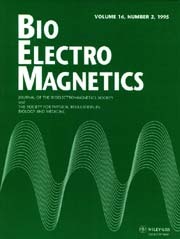 Bioelectromagnetics is a journal that combines the best research in electromagnetics in biology and medicine with a unique mix of articles dedicated to nonionizing radiation effects, exposure dosimetry, safety protection and medical applications. Bioelectromagnetics covers the entire spectrum of nonionizing radiation research and is essential reading for biological scientists, engineers, medical doctors, physicists, and public health specialists in academia, government, and industry. The journal is open to a broad range of topics whose central theme falls within the interaction and application of electromagnetic fields and waves in biological systems, spanning static fields to terahertz waves and visible light.